This is a summary of a research study conducted by ICORD Principal Investigator Dr. Brian Kwon and colleagues. To read the original paper, please click here. A biomarker is any measurable indicator in the body that represents a certain condition. Having a biomarker is helpful in assessing an illness, and sometimes in selecting the most effective treatment for the illness. 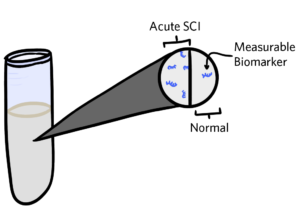 Why does finding a biomarker matter in acute spinal cord injury (SCI)? The current neurorestorative* treatment options for acute SCI patients are limited. Clinical trials investigating these treatment options have not yet yielded convincing results, in part because of the challenges in recruiting and diagnosing research participants. Collecting standardized, baseline measures of neurological function in acute SCI patients has been done by clinical trials when recruiting SCI research participants in order to categorize them and assess the effectiveness of different treatments. While this method might sound promising, determining the baseline function of these participants is actually rather difficult, as acute SCI is a very diverse condition and recovery differs greatly between individuals. External factors often make measuring baseline functional severity hard or impossible. Unable to accurately determine the baseline severity of injury, researchers are forced to exclude many acute SCI patients from clinical trials. With very limited numbers of participants, the progress of developing effective treatments is thereby hindered. Dr. Kwon and his lab identified the issue of enrolling more candidates in studies, and sought a blood-borne biomarker for different severities of acute SCI. One promising class of biomarker Dr. Kwon is investigating is called microRNA. MicroRNA are very small genetic molecules that regulate functions in the body. Dr. Kwon’s research shows that the types and quantity of microRNA* differ between various SCI severities, and they proposed using these serum microRNA as acute biomarkers for SCI. Dr. Kwon’s lab looked at several measures in groups of different spinal cord injury severities (uninjured, mild, moderate, and severe) from the time of injury to 12 weeks post injury: behavioral outcomes, the amount of spinal cord tissue that was damaged, and microRNA levels in the blood serum. Reduced function and locomotion was observed after injury, with the severe SCI group being the most affected. Additionally, results from spinal cord tissue examinations showed that the more severe the SCI, the more damage was seen in the spinal cord. In terms of microRNA levels in the blood, an overall increase was observed in the days after injury in the severe and moderate injury groups, but not in mild and uninjured groups. In fact, higher serum microRNA levels were linked to worse behavioral outcomes and more damage in the spinal cord. Another interesting finding was that unique microRNA types were found with different injury severities. Since the quantity and type of serum microRNA correlated with behavioral and tissue damage data, microRNA was shown to be an effective and objective biomarker for classifying acute SCI severity. So… What does this mean for people with SCI? Blood serum microRNA allows for an accurate SCI diagnosis of severity as early as 1-3 days post injury, and it serves as a potential predictor for the outcome of long-term recovery. This finding benefits clinical studies. The fundamental challenge of patient enrolment in clinical studies to date has been the inability to correctly identify the severity of a spinal injury. With the help of microRNA biomarkers, more SCI participants can participate in research, in turn facilitating the development of improved therapies. Individuals living with SCI also benefit from this research. In the future, the chance of early intervention is increased if a diagnosis can be made immediately after injury, which would be made possible by having a reliable biomarker. Instead of huge medical spending on ineffective treatments, SCI patients can be assessed sooner and receive medical intervention that is best suited for each of them.